I love Nanas because it’s bright and cheery. The fabrics and the displays are so pleasing to the eye. The staff is always friendly, wiling to stop what they’re doing to help. The enthusiasm for quilting, creating things from fabric is contagious. Even if I didn’t sew, I would still go to Nana’s. I love this quilt store. If you want to be treated as more than just a potential customer this is the place to go. They are extremely helpful and friendly taking the time to understand and work with their patrons regardless of skill level. They have wonderful projects and the materials to complete them and I have never gone away disappointed. 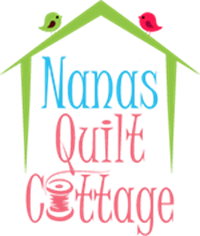 I love the warm greeting that I get when I walk through the door into Nanas Quilt Cottage! Marybeth and Rebecca are helpful with fabric selection, supporting new projects, and teaching a technique that supports quilting or finishing a project. I like how the shop uses its space featuring new quilting projects. Classes are available to learn about the featured projects too. Groovy Girls has been a great opportunity to learn techniques and share our projects made. It enhances a small community feeling. I leave feeling encouraged and know that if I forget something, I can call for help. It is my favorite quilt shop to visit.